We had our first bible study session on the Gospel of John today, and I must say it was fruitful. There were just the eight of us - about 10% of the size of the congregation - which I was told is the norm. 3. Epistles - letters of Paul, Peter, etc. This Gospel is among the most debated books in the bible - particularly on its authorship, date of writing and time length of writing. 4. Style - written in simple Greek, distinctive dialogues, discussions and long discourses, features the way people misunderstand Jesus (e.g. Nicodemus and "being born again", double meanings (e.g. Jesus being lifted up), dualism (e.g. light and darkness). 5. In the Synoptics but not in John - Jesus' baptism, temptation, exorcisms, pithy parables, much reference to the kingdom of God, the Transfiguration, institution of the Lord's Supper. 6. In John but not in the Synoptics - turning water into wine, raising of Lazarus, the "I am" sayings, explicit affirmations of Jesus' pre-existence, the piercing of Jesus' side. 1. I brought up the fact that the epistles were written before the Gospels. Like how I was surprised when I first found that out, the group was too and asked multiple questions about when what was written, and when Paul was converted. I just found a Timeline of Christianity in Wikipedia, of which I will definitely highlight next week. It lists out a lot of information and you would need to wade through it to find what you need. However, it did not indicate the year Paul was converted. I found out somewhere that it the year is circa A.D. 36. Close? 2. I also highlighted that the Gospels in general are not written chronologically. 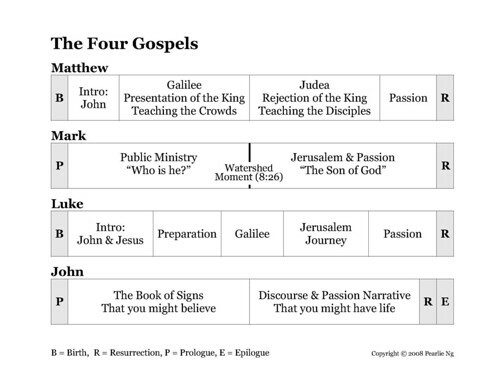 The evangelists wrote the Gospels for their set purposes and structured them in a way to achieve that. Someone asked which Gospel then would be the most chronological one. I promised her I will l find that out but now that I think about it, how does one define "most chronological" - it just is or it is not. I found a very interesting diagram here. It is labelled "sample" all over though - I wonder which area of that diagram is a sample, and what is it a sample of? Finally, I also found a good summary of the books of the New Testament here, referenced to Metzger's The Canon of the New Testament. The internet is such a good place to find information, but only if we know what's good for us. Anyway, I have started a repository of bible resources for studying the Gospel of John here. Do let me know if you have some good resources I can include or link to. Finally, to draw the study of the day to a close, I made it a point to appropriate what we learn into practicalities. I referred the group to Carson's session on "What is the Gospel?". His main concern is the danger of reducing the Gospel to something assumed. If the pastors and leaders of the church assumes the Gospel and proceed to be concerned with everything else other than the Gospel -- be it evangelism, the poor, happiness, prosperity, doctrinal debates, dangers on the left, dangers on the right, and what have you -- we will train a new generation to downplay the gospel and focus zeal on the periphery. Though some of these are not only important but are commandments of God, they are not the Gospel. It is worth listening to. The mp3 is found here and the transcript, if you would rather just read it, is found here. Hi Pearlie - About the stickey note I don't know for sure. I've seen them on other blogs and wanted to keep this at the top so called it that and what I will do is edit it each day and change the time of the publish to keep it on top. There may be a more direct way to do it but this will work for me. That is what I did when I had the Guest Book I would put on top from time to time. Good to know you still check me out!!!! Pearlie, I like your new blog for resources on the Gospel of John. I hope you will keep adding to it. Keep up the good work. Thanks Alex for your encouragement. Yes, I plan to update it as and when I have good stuff. But I found Wordpress very difficult to work with and have transferred it back to the good ol' faithful Blogger. Check it out here.